Linda defeated four strong players to become this year's Champion. On Tuesday, she defeated Geri Mclauchlan of Medinah. 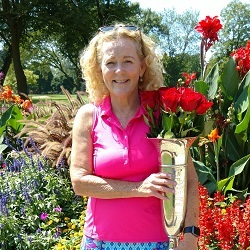 On Wednesday she played successive matches to defeat Ann Saladino of La Grange and Monica Coleman of Twin Orchard. Her final match was played on Thursday against Ellen Rehm of Butterfield. The entire field played in drenching rain on Tuesday and distinguished themselves with positive attitudes. This was rewarded on Wednesday with glorious golf weather that continued through Thursday. Players and our hosts at La Grange are to be complimented on grinding it out under adverse conditions. 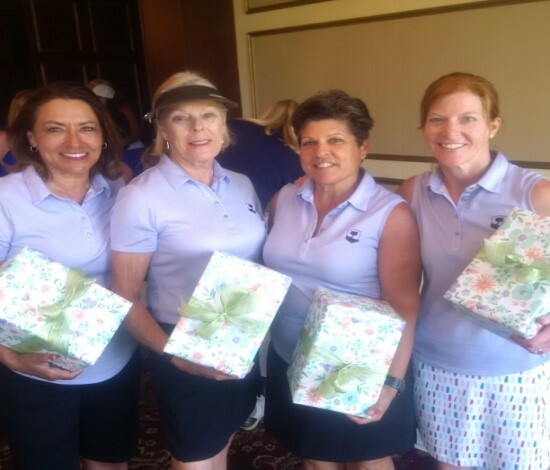 Riverside Country Club in Riverside hosted this year's Senior Better Ball Tournament to the delight of a very full field. 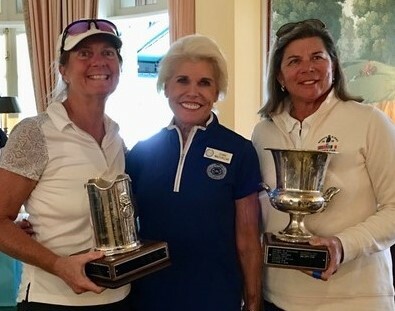 Overall winners, Martha Glass of Briarwood and Jill B Selati of Northmoor won in a tight competition, to have their names engraved on the Senior Better-Ball of Pairs trophy which is displayed at the Golf House. 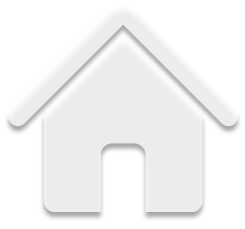 Click for full results. Many thanks to White Eagle for a beautiful day on a challenging golf course. 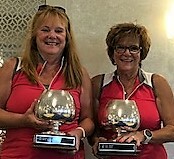 The winners of this year's Better Ball Tournament, from McHenry, are Patti Lolmaugh and Sue Overland with a stunning 59. They are pictured above with the trophies that will be engraved and displayed at Golf House. Complete results are here..
Onwentsia hosted a beautiful day of golf for this year's One Day Stroke Play. The overall low gross winner was Robin Donnelley of the host club. Overall low net was won by Lynn Castro of Medinah Country Club. Both are pictured above with Diane Mazurczak, CWDGA Tournament Chair. Complete results are here..